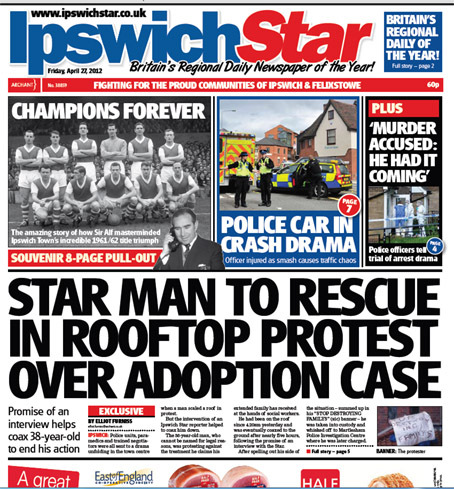 Ipswich Star journalist Elliot Furniss succeeded where police, paramedics and trained negotiators had failed in ending the five-hour protest. He persuaded the man to come down after agreeing to let him put his point of view in an interview with the Archant-owned title. The drama was covered on the Star’s front page and across a double-age inside spread today. The 38-year-old man, who cannot be named for legal reasons, was protesting against the treatment he claims his extended family has received at the hands of Suffolk social workers. He had been on the roof since 4.20am yesterday and had resisted all previous attempts to coax him down. Recounts Elliot: “After getting a call to the newsroom, I made my way to the scene. Little did I know that an hour later, I would be in the back of a police van talking to the man at the centre of the incident. “I saw the man, equipped with sandwiches, a flask of tea, a tarpaulin, some cigarettes, a sleeping bag and “STOP DESTROYING FAMILY” banner, on the roof of the entrance and perched on the porch of St Edmund House. “I told police that the paper could put across his side of the story and they thanked me as they said that could be used to encourage him down. It seemed to work as he made his way down and spoke to me in the back of a police van. After spelling out his side of the story, the man was taken into police custody. Well done Elliot but I think rooftops are particularly dangerous places for journalists these days given the dire state of the industry. The temptation to chuck oneself off might become overwhelming faced with redundancy threats, Hub nightmares, slave wages etc. But were there any photographers left to record this, or was it done by CJs….